Both Houses of Parliament were adjourned for the day today in the post-lunch session as both opposition and treasury benches traded charges over the leakage of the Pathak report even as indicted Natwar Singh sought to raise breach of privilege notice against Prime Minister Manmohan Singh in the Rajya Sabha. Although it is clear that former External Affairs Minister Natwar Singh’s days in the Congress are numbered, especially after he went ahead with the privilege notice against the Prime Minister, the party appeared reluctant to take any action against the defiant leader. The Justice R S Pathak Inquiry Authority report into Iraq's Oil for Food scandal tabled in Parliament today indicted former Union Minister K Natwar Singh and gave a clean chit to the Congress. Should owners be fined if their pet dogs dirty the streets? India today conveyed two things directly to the United States — neither being music to ears of the “strategic partner”. 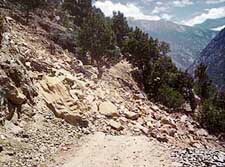 A massive landslide, allegedly triggered by intense blasting at Pangi village, near Reckong Peo, district headquarters of Kinnaur, on Monday morning damaged a 200-m stretch of the old Hindustan-Tibet road, commonly known as the mule track, and blocked the new Hindustan-Tibet road for many hours. I have never committed any wrong. I will fight inside and outside Parliament. The Chhattisgarh Government today banned use of soft drinks in all government organisations of the state, including schools, colleges and state secretariat. Looking into the current report of high content of pesticides in cold drinks, the state government decided to ban use of Coca Cola and Pepsi in all government organisations, Health Minister Krishna Murti Bandhi said here. In a shocking incident, a five-year-old boy was bobbitised when his stepmother rebuffed the sexual overtures of a man in a Bihar village, the police said today. Pravin Singh (22), son of an influential landlord, took fancy to Renu Devi, the second wife of Jageshwar Mahto. A “sanad” (document), written by Guru Gobind Singh, discovered at Handiya tehsil in Harda district of Madhya Pradesh has been verified by the Archaeology Department. The much-awaited assured promotional scale for employees, popularly known as the ‘‘4-9-14’’ promotion benefit, will not come up for formal approval at the meeting of the Punjab Council of Ministers scheduled for August 10.